Danish playwright Henrik Ibsen’s A Doll’s House, first performed in 1879, is a classic straight out of the Western literary canon. Often noted as the father of realism and founder of the Modern theater, Ibsen was prolific, producing over twenty plays in his lifetime, of which A Doll’s House is his most noteworthy. The play is lauded for its progressive feminist plot: in the midst of her husband’s illness, Nora takes financial matters into her own hands. After her husband’s furious discovery and reaction to this, she ultimately leaves her family to escape the chauvinistic confinements of marriage. Its realist-style staging of the complexity of being a modern (married) woman in 19th century Europe also contributed to establishing its spot in the canon and on English syllabuses across the world. To proclaim that A Doll’s House still anchors the Western literary canon and is still widely read and taught perhaps misses the point that contemporary audiences are less and less familiar with its significance—by which we mean it’s just super difficult to get contemporary audiences to give a damn about a play about 19th century marriage. What was provocative and groundbreaking as a feminist narrative in 1879 is naturally less revolutionary in 2017 and thus harder to win over contemporary students, readers, or viewers. Here in 2017 women can vote, wear pants, manage money, remain single, and eat treats whenever the hell they want (a point Cherdonna makes deliciously clear in her adaptation of the play, but we’re getting to that): feminism and a woman’s role in modern Western culture is so vastly different than it was a century and a half ago that the text’s continued salience is more difficult to excavate from beneath the tedious layers of petticoats, top hats, and sitting room manners and decorum. The Washington Ensemble Theatre, however, seems deeply attuned to both the cloud of apathy that veils A Doll’s House as well as its latent potential to provoke the modern (or are we the postmodern?) audience, and calls on Cherdonna’s unique brand of creativity to give the narrative a heavily made-up postmodern, hyperreal face lift. WET’s co-director, Ali Mohamed el-Gasseir, partnered with the modern dance/performance artist/bio-drag queen Cherdonna (Jodi Kuehner) to enliven the story, the result of which is a wild, at times surreal, at times hyperreal, theatrical experience that challenges dominant expectations of the theater-going experience. The collaboration produces a play that raises questions about the theater’s role in re-presenting canonical classics that challenge contemporary configurations of feminism. 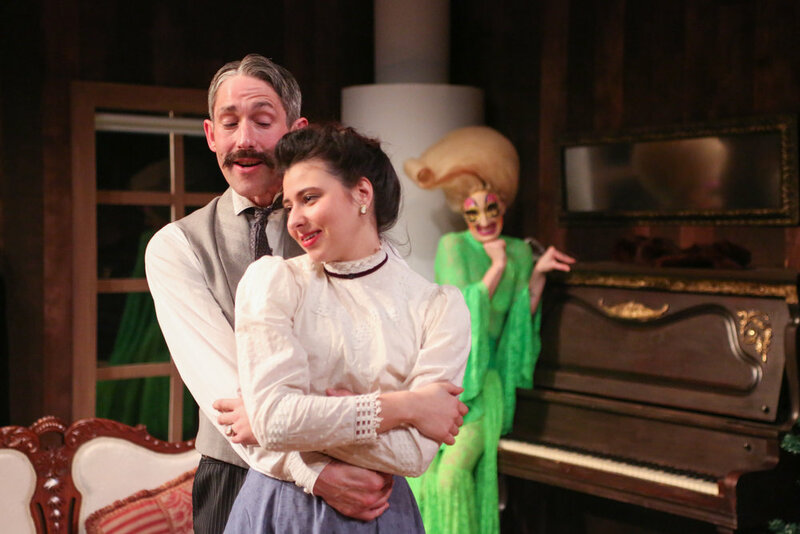 Before we get into the review of the play, let’s talk about Cherdonna Shinatra, because in many ways, she is the play and A Doll’s House is, in this adaptation, her doll’s house, her plaything, hers to configure, manipulate, direct, at whim and with whimsy. Cherdonna (Jodi Kuehner) is an acclaimed Seattle-based bio-drag queen and contemporary performance artist. (For those of you who, like us, needed to Google the term “bio-drag,” let us save you a search: a bio-drag queen is a woman who performs drag as a way to question the stereotypes and norms of performing gender and sexuality.) WET’s and Cherdonna’s adaptation of A Doll’s House infuses the play’s feminist plot with contemporary elements to foreground its ongoing relevance in (post)modern Western middle class culture. The play’s textual and performative limits are exposed and transgressed, and its female characters test each other’s limits in what culminates in a showdown between Nora and Cherdonna that showcases the plural and irresolute nature of contemporary feminism. One of the play’s strengths is its self-reflexive awareness of its own textual, performative nature; from the beginning the actors and Cherdonna clash as the actors attempt to perform the classic version of A Doll’s House while Cherdonna immediately begins transgressing the fourth wall. As the theater lights dimmed and the stage lights come up, the familiar soundtrack to PBS’s Masterpiece Theatre trumpeted as if signaling the beginning of a classic, but Cherdonna shortly lopes into the theater in a neon green lace pant suit with bellbottom legs and sleeves and luscious cotton candy hair and, rather than sitting in her cartoonishly large and decadent royal red director’s throne amongst the audience, flows onstage, toys with the set, and disrupts the “masterpiece” affect. As she caresses each set piece, from the Christmas tree to the furnace, the audience gets the sense that she is toying with the props as if they were hers to play with, her own doll’s house. This caressing and dancing over and around the stage gets a little excessive; if the point is to disrupt audience expectations, it could have been shorter; at some point the discomfort ceased and the awkwardness of the scene became tediously boring. But from what we know of Cherdonna, she’s not in the business of making things convenient. WET’s adaptation allows the actors to perform the first and most of the third of the play’s three acts in “real time”; the second act gets compressed into a simultaneous, abbreviated performance upon Cherdonna’s command to “DO IT ALL AT ONCE” (at which all characters respond by performing the second act, well, all at once). As the first act begins with Nora (Leah Salcido Phenning) and Torvald (Jason Sharp) bantering about Nora’s spend-thriftiness and love of sweets and Torvald’s classically demeaning brand of paternalistic chauvinism practically oozing from the stage, this 2017 audience gets that Ibsen is setting the patriarchal conditions which our famously feminist Nora eventually rejects. What we did not yet get was Cherdonna’s presence; early in the play she floats on and off stage, mirroring Nora’s movements and dancing around (and with) the set in a way that left us uncertain whether the actors could “see” her or not, creating a kind of anticipation as to how exactly she fits in this classic play. Slowly, Cherdonna integrates herself into the performance. When Torvald disappears into his office and Nora sneaks a sweet from her coat jacket, she offers one to Cherdonna as well, a moment of contact and an acknowledgement that Cherdonna is more than a shadow but not (yet) a character. Cherdonna at once treasures this connection with Nora, which she demonstrates in a hyperbolic fawning over her, and flaunts her 2017 female liberation by making cookies fall from the ceiling in the very next scene. The juxtaposition of Nora sneaking sweets and Cherdonna “making them rain” illuminates one aspect of how Cherdonna will apply pressure to outdated conventions of the original play, and demonstrates how her relationship to the primary Nora becomes the nexus of the play’s intersectional feminist critique. The intense, compressed second act, in which Cherdonna’s biodrag proclivities (which involve drag show lights, a Cher performance, a pole dance, and more cookies raining from the ceiling) pushes the actors, who desire to perform the play in its traditional spirit, over the edge. The pressure of Cherdonna-the-director’s biodrag manipulations on Nora in particular is compounded by the play’s original patriarchal, misogynistic spirit, exemplified in a fabulous mansplaining episode in which Torvald offers a condescending monologue of how to really be “biodrag,” and then offers some kind of insight on something about menstruation and the moon, too. The result of the confluence of these directorial and misogynistic pressures is a spectacular fallout between Cherdonna-the-character and Nora-the-character/Phenning-the-actress, who is furious at Cherdonna for interfering in her opportunity to play the classic, canonical role of Nora in a way that honors the revolutionary feminist spirit of Ibsen’s original play. Torvald’s misogyny, in other words, is something she as a classic Nora can handle; Cherdonna, she cannot. This is where we really think the play delivers its juiciest critique: both women see A Doll’s House as an opportunity to perform femaleness in a way that breaks from its socio-temporal restraints and limitations. But, their individual expressions of what it means to be a feminist clash, foregrounding the irresolute and inherently contradictory nature of feminist expression in any time period. Feminism, the play is suggesting, is always plural, contradictory, and non-conforming. This is where WET showcases its commitment to Ibsen’s original, canonical, “progressive feminist plot” as it updates the ways in which that manifests in the contemporary moment. The clash between the female characters ends with Cherdonna changing out of her drag and departing from the set entirely, leaving behind an emptiness felt deeply by the audience (whom Cherdonna had interacted with continually throughout the play). It seems as if Nora/Phenning “wins” the right to best express transgressive feminism. The remainder of the third act is performed with the fourth wall up, by its original script and stage directions. Phenning has her long-desired spotlight moment as she performs Nora leaving Torvald. But as the play closes on a recently-abandoned Torvald alone on the couch bearing the weight of the events of the play, the absence of both female characters transforms into a felt unspoken solidarity between the two of them: however they might disagree on how to perform progressive feminism, both reject structures of power that deny them the freedom to express themselves. This is as pluralistic and intersectional as feminism can and should be.